Alright, so Darling! 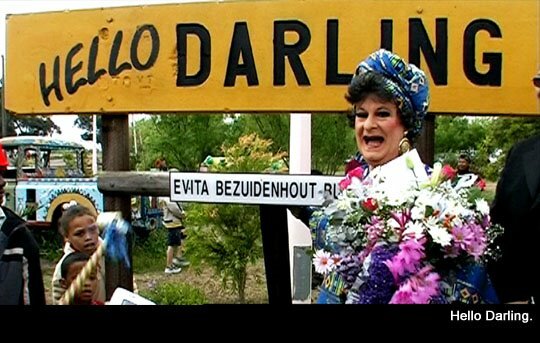 is not simply all about Evita as much as her creator, Pieter-Dirk Uys, an actor who took up the arms of satire against the apartheid regime. With the election of Mandela, there were those who thought that Uys’ work was done. That he could take off his dresses and do something classical. Shakespeare, perhaps. But no. An unholy trinity – Mbeki, Aids, ANC corruption – has ensured otherwise. If Uys’ one-man Aids-awareness campaign is unparalleled on the level of singular political engagement – he has spoken to hundreds of thousands of schoolchildren in over the years, and he finances himself from his earnings at his own cabaret theatre, Evita se Perron in Darling, near Cape Town, and abroad – then it’s also doubly extraordinary in that he draws a humour from the appalling situation. To be sure, it can sometimes be a dark humour – when the South African Department of Health released 44 million free condoms to the population, they stapled each one to a piece of card – but its thrust is brilliantly effective. Uys never misses a chance, even in this advert for the South African franchise of the Nando’s burger chain: go, girl!